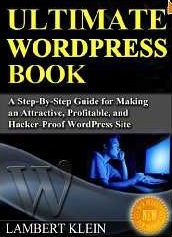 Create Attractive, Profitable and Hacker-Proof WordPress Sites with the Ultimate WordPress Book! Want to create a website you can be proud of using WordPress? I’ll show you how to make a site that not only looks great and makes you money, but also repels viruses and hackers! Hi, I’m Lambert Klein, author of several WordPress Best Sellers here in the Kindle Store. To make things super simple for you I’m combining three of my most popular books (and a super exclusive special report) into one ULTIMATE guide for you! Exclusive to this compilation book, you won’t find this very special report anywhere else. This report is all about one thing: helping you make money with WordPress! Perfect for Both Newbies and Veterans! The Ultimate WordPress Book is designed help you design the WordPress site of your dreams regardless of your experience level. Whether you’re just now hearing about WordPress or whether you’ve already started using it, this guide will show you exactly how to turbo-charge your site and create something visually attractive, extremely profitable, and keep it safe from hackers/viruses! Buy The Ultimate WordPress Book Today and Make a Site You Can Be Proud of!